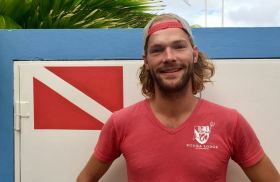 Our dive team consists of four professional instructors; Daan, JP, Mats, Pieter and Remy. 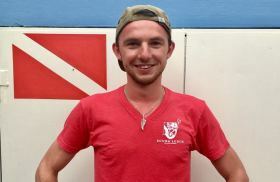 All of us have years of diving experience on the island and internationally. Our PADI certified scuba diving center is suitable for beginners and experienced divers alike. You can start your diving adventure with an introduction dive, also called Discover Scuba Diver, or sign up for a complete course. You can contact us at diving@scubalodge.com, (+5999) 465-2575, or drop by our dive center. In 2017, we renovated an American school bus and turned it into our Scuba Bus. Our fully refurbished school bus offers plenty of space for dive equipment, snorkeling gear, and beach bags. Ideal for families or groups of friends traveling together, even when some in the group are naturally inclined to be active while others would rather relax. Whatever your preference, the "red sled" will get you all over the island in comfort and style. 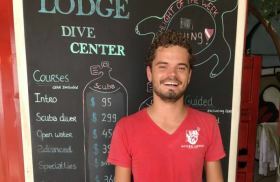 We offer special rates for interns and locals, and if you're staying at our hotel, we can offer you a special discount when you go diving with us. Hates water. 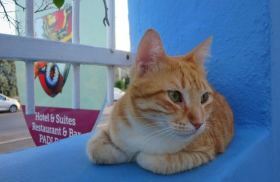 Loves fish and napping at the Dive Center. Lowest Price Quarantee & No Reservation Fees!